Is everyone gearing up for Oscar weekend? I still have to catch up on some of the movie nominations but unfortunately I have a lot of non Oscar plans jammed into my weekend. Hopefully I'll find time to watch them before Sunday, and if not, I can always drool over the celebrity style on the red carpet! Hopefully they'll have a mani cam like the Grammys did. Tonight I have the other two Pahlishes that go along with Like Calendars Dying that I swatched this past weekend. These follow the same combination of creamy base and matching glitter. 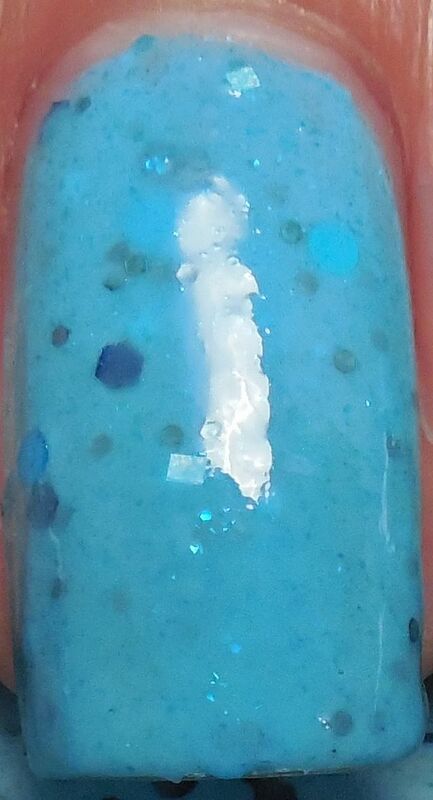 The first one I'll show you is Clanking Of Crystal, a sky blue based cream with black hex, white matte squares, and blue circle glitter mixed with blue microglitter. I love the combination of glitter in this but unfortunately once the polish is on the nail, the glitter gets swallowed up by the blue cream. I had no trouble with application, I used three coats and they all went on smoothly with no clumping or dragging of glitter. It did dry a little matte on its own so I used SH Insta Dri for some extra shine. And finally I have Little White Candle, a light grey cream with black and silver mutli sized hex glitter. I again had no trouble with application but it was a little sheer. I used three coats in this mani and you can still see a little VNL. I used topcoat in these pics as well. Overall I really liked the polishes from this particular line by Pahlish, but I was a little disappointed by Clanking of Crystal. I wish the glitters showed through better, maybe if it's thinned a bit the glitters will pop more. I hope so because the glitters in that shade are really spectacular together. Do you like cream glitters or do you prefer jellies instead?